Jupiter's moon Io looks like a giant pizza. This poor moon suffers from huge "Io-quakes" and violent volcanoes. On planet Jupiter's moon Io ("EYE-oh"), the ground itself moves up and down like an elevator taking people to the top and bottom of a 30-story building! On Earth, we have ocean tides because the moon's gravity pulls a little harder on the side closer to the moon than the side farther from the moon. On Io, the gravity of Jupiter and Jupiter's other large moons yank on Io every which way. Although there are no oceans on Io, its "solid ground" tides are more than five times as high as the highest ocean tides on Earth! Actually, Earth has solid ground tides too, but they amount to less than 20 centimeters (about 8 inches). Here, the gravity of Jupiter and large moon Ganymede (with help from moons Europa and Callisto) play tug-o'-war, with Io playing the part of the rope! Io bulges on two sides like a football. At this time, Jupiter and all three of the other large moons pull on the same side of Io. Its orbit bends to pull it closer to Jupiter. Io is again squished like a football. All this bending causes heat to build up inside Io. Io gets so hot inside that some of the material inside melts and boils and tries to escape any way it can. So it blows holes in the surface! That's what volcanoes are. Some on Io have shot their hot gas plume 300 kilometers (about 200 miles) into space! 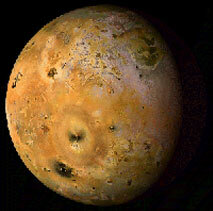 The Galileo spacecraft took this picture of Io during its closest flyby in October 1999. Galileo was only about 600 kilometers (400 miles) from Io's surface. NASA's Galileo spacecraft, which orbited and studied the Jupiter system from 1995 to 2003, flew closer to Io than any other spacecraft. It revealed gigantic lava flows and lava lakes, and towering, collapsing mountains. 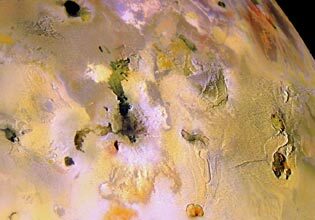 These pictures of Jupiter's moon Io make me hungry for pizza! Mmmm. 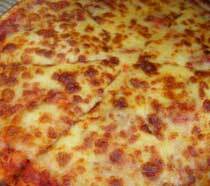 Cheese pizza right out of the oven. Or is it Io, with lots of volcanos ready to blow?